It is one of the world's most beloved symphonic compositions -- a shimmering, evocative musical treatment of the legend of Scheherazade. 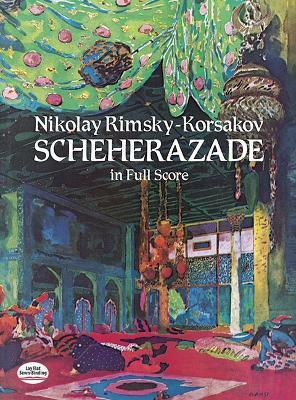 Composed in 1888 by Nikolay Rimsky-Koraskov (1844-1908), Russian master of orchestration and luminous tone-painting, Scheherazade re-creates the legend of the Sultan Schahriar, who, convinced of the perfidy and faithlessness of women, vowed to execute each of his wives after the first night. But the Sultana Scheherazade saved her life by telling the Sultan fascinating stories for 1001 nights, staving off her demise by keeping the sanguinary ruler in a state of suspense over the outcome of the tales she told. IV. Festival in Baghdad. The sea. The ship breaks up against a cliff surmounted by a bronze horseman. Conclusion. This Dover edition is an unabridged and unaltered republication of the score originally published by M. P. Belaieff in Leipzig. It contains every note of the original composition in large, clear notation, as well as a new English translation of the "Program." Musicians, students, musicologists, and any music lover will welcome this sturdy, inexpensive study score of one of the landmarks of the classical repertoire.